A Fluidized Catalytic Cracker (FCC) is often the center piece of an oil refinery. The process is designed to 'crack' the gas oil fraction of the distillation process. The cracking is done by means of a catalyst which behaves like a fluid when aerated with vapor. Typical FCC feed stocks are atmospheric gasoil, vacuum tower bottoms or coker gasoil. 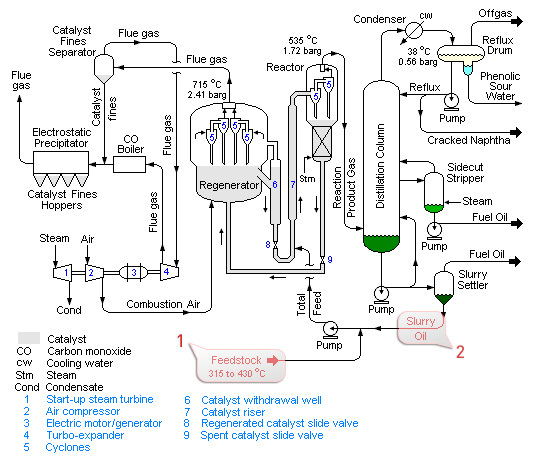 The hot feed is contacted with steam and then with the catalyst. This process changes its carbon molecule structure from heavier to lighter molecular weights. The FCC output products are mostly alkylation unit feed stocks such as propylene, isobutene, gasoline or diesel fuel. The FCC’s feed rate (see #1 above) must be optimized against other operating parameters (such as catalyst circulation, alkylation capacity, gas compression capacity etc.). Such feed liquids are mostly very hot and thus a challenges to conventional flow meter technologies. The slurry oil measurement (see #2 above) is a very important indicator of how well the cracking process runs. This liquid is difficult to measure as it contains traces of the catalyst and is very abrasive to intrusive flow meter technologies. The orifice plates in the slurry oil application erode and misread the flow. They are also maintenance intensive in that the liquid enters and clogs the pressure impulse lines causing false readings. Cleaning these lines becomes a regular maintenance routine and can be dangerous because of the liquid temperature. FLEXIM offers the optimal solution for the flow measurement in such environments. As the transducers, in conjuction with the WaveInjector, are simply clamped-on to the pipe, they are never in direct contact with the medium and are thus not prone to abrasion or clogging. The measurement stays reliable and accurate and is not subject to drift.